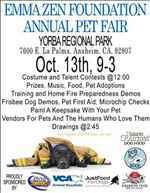 Vendors, Free Raffle, Dog Walk, Demonstrations, Pet First Aid Lectures, Microchip checks. Come and Join us in all the fun! All well behaved leashed dogs are welcomed.